Cropland can be quite susceptible to wind erosion under some conditions. Cooler-than-normal temperatures and drought conditions may limit vegetative growth and cover. Burning or removing crop residues for forage creates a particularly serious hazard. Winter wheat and other fall-planted crop fields also may be susceptible during periods of low cover in the winter and early spring. This is particularly true after a drought year. Marginally productive cropland may not produce sufficient residue to protect against wind erosion. In addition, overgrazed or poorly vegetated rangeland may also subject to wind erosion. Recent wind conditions have been conducive to erosion (Figure 1), given the peak wind gusts that have been recorded in Kansas over the last few days (Figure 2). Figure 1. Blowing soil across Kansas Highway 27 in Sherman County on April 17, 2018. Photo taken by Jeanne Falk Jones, K-State Research and Extension. Emergency tillage. 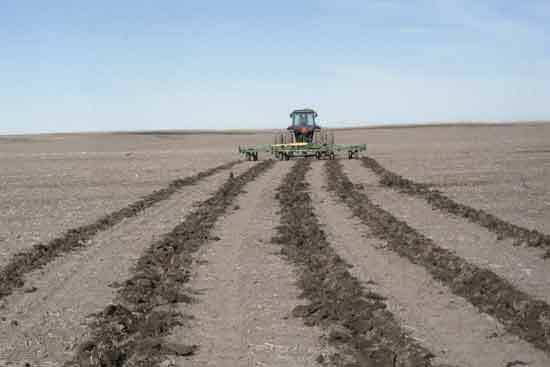 Emergency tillage is a last-resort method that can be effective if done promptly and with the right equipment. The goal of emergency tillage is to make the soil surface rougher by producing resistant clods and surface ridges (Figures 3 and 4). A rough surface reduces wind speed. The larger clods and ridges resist movement and provide traps to catch the moving soil particles. Figure 3. Emergency tillage across 50 percent of the field. Photo courtesy of USDA-ARS Engineering and Wind Erosion Unit, Manhattan, Kansas. Figure 4. Widely spaced shanks used for emergency tillage, making clods to roughen the soil surface. Photo courtesy of University of Nebraska. 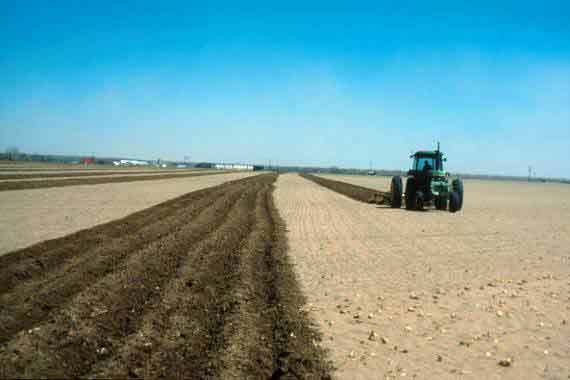 If 50% of the area has been tilled and wind erosion persists, the omitted strips can be emergency-tilled in a second operation to make result in full-cover tillage. If a second tillage pass is needed, it should be at a greater depth than the first pass. Wide-chisel spacings are used in the full-field coverage method. The space between chisel grooves can be chiseled later should wind erosion persist. A 14-inch moldboard lister spaced 40 to 50 inches apart (or an 8-inch lister on 20- to 24-inch spacing) is needed to create sufficient surface roughness. The first listing pass should be shallow, not more than about 4 to 5 inches deep. Then, when additional treatment is needed, the depth should become progressively deeper. Alternatively, for the second treatment, the original ridge may be split. This page generated in 0.01208 seconds.